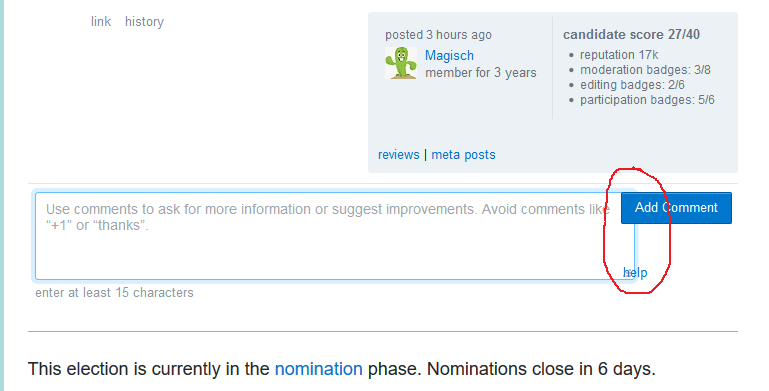 There is an alignment issue in the Election - "add comment" UI. The Add Comment button and help link is overlapped with the comment box. Currently the ongoing election in "The Workplace". The issue can be reproduced with recent Google Chrome and Mozilla Firefox browsers with 100% zoom. This should be fixed now - the bulk of the page was forced into content-box sizing mode to handle the old design, but comments now rely on border-box sizing. The fix here was to rework the rest of the page to accommodate this sizing mode, removing the need for the hack. Also made the election pages responsive in the process, so you can now enjoy reading nominations on your phone if you wish to. Thanks for the report and your patience! Not the answer you're looking for? Browse other questions tagged bug status-completed comments design election .